A Camera Phone with More Resolution than a Digital SLR? Symbian may be dying, but Nokia it is not. By now you’ve probably heard about their 38-megapixel camera phone, which was announced last week at the Mobile World Congress show. 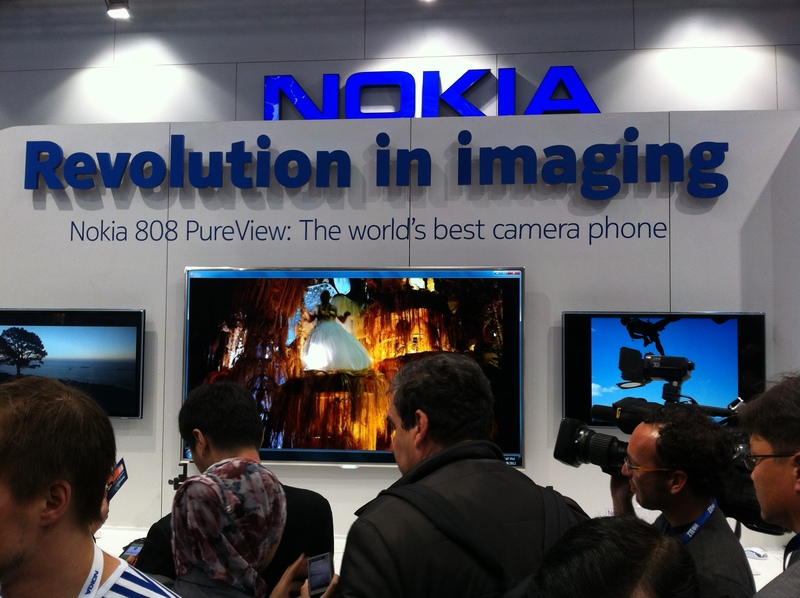 The Symbian-based Nokia 808 PureView has a Carl Zeiss 41-megapixel sensor and takes photos which have more resolution than some high-end consumer DSLRs. I know this sounds like a gimmick, but seeing is believing. Full resolution photo samples can be viewed here. Just make sure to right-click on the photo sample and select original size. The camera is supposed to launch in the second quarter and uses a pixel over-sampling technology is supposed to ensure no loss of detail when zooming in on images. Apparently Nokia uses a technology called pixel-binning which reduces noise makes this possible. The demos shown of the show floor were truly impressive. The person I was talking to took a picture of her jeans and then tapped on the screen to zoom in to the point you could see individual fibers. You can also slide your finger on the screen to zoom. Photos taken by the phone are 7728×5368 pixels. 16:9 photos are 34MP, not 38MP and occupy 9 to 16MB of space. Although the 808 PureView only has 16GB of internal memory, it supports MicroSD cards up to 48GB. Although there hasn’t been much talk about the speed of the phone, I was told it can focus and take a photo in less than one second. Basic specs can be found here. Technical details can be found here. I spoke at length with Nokia’s Senior Manager for Audio Hardware and got some juicy details you won’t find anywhere else on the Internet. Anyone who has ever tried to record a live concert with an iPhone knows you cannot do it without using expensive third-party mics. 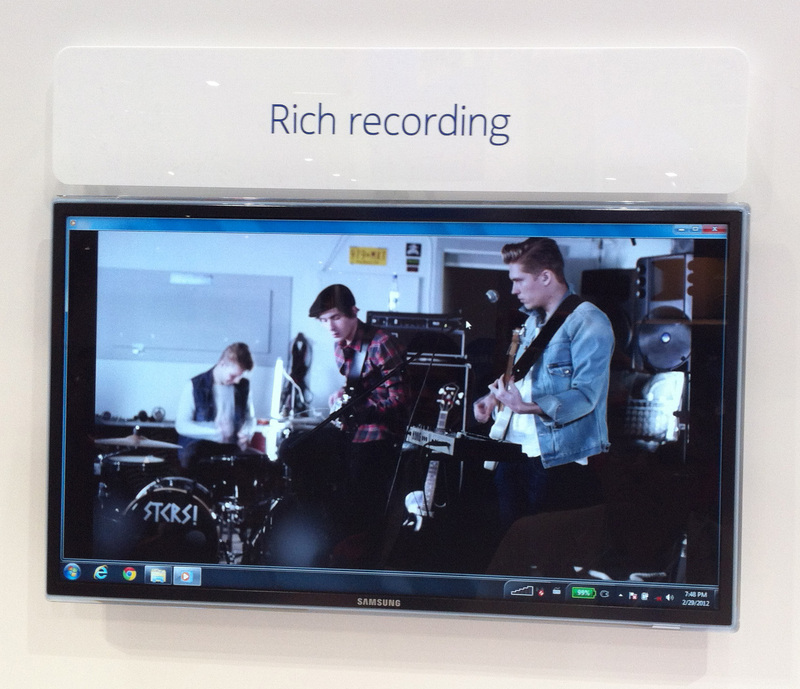 This video compares recordings of a live band made on the iPhone 4S, Samsung Galaxy S II and Nokia 808. Both the iPhone 4S and Galaxy S II distort horribly. They also both roll-off most of the low frequencies causing the bass guitar to almost disappear. According to Nokia, this roll-off begins at 200Hz, and is very sharp. See the chart below for proof of this. Nokia’s PureView technology records audio down to 25Hz. Why is Nokia’s recording so much better than other smartphones? Most smartphones have a single mic which is optimized for voice. Nokia uses two good omnidirectional mics, so it’s capable of recording stereo music. But that’s not why it sounds so much better than the others. Their audio hardware has been designed so it’s capable of recording audio up to 147dB without audible distortion. The frequency response of their new audio hardware is also relatively flat. Down 3dB at 40Hz and 20kHz. 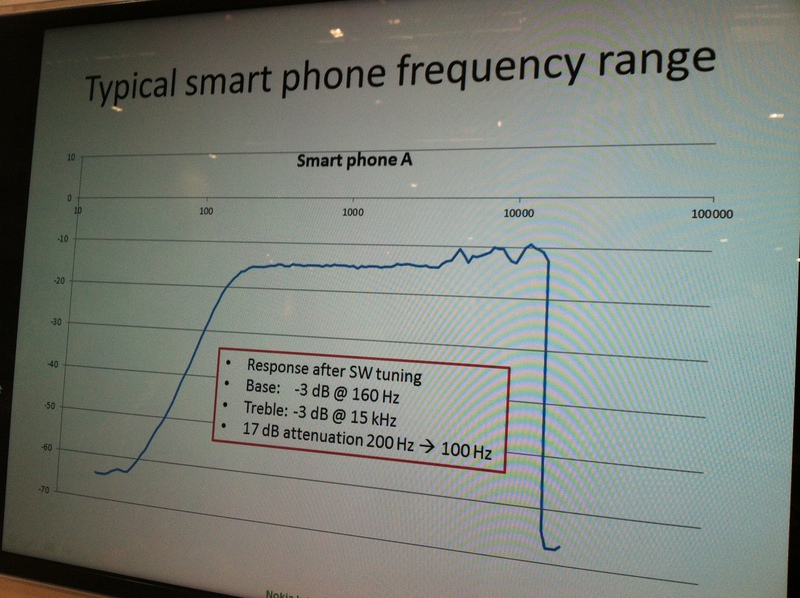 There is currently a nasty 8-10dB peak around 8kHz, but Nokia says they will tune that out before the 808 PureView ships. There are only two issues I see with Nokia’s Rich Recording technology. The first is the fact that it operates at a very low-level and is not part of the 808’s camera app. This could make it hard to port to non-Symbian phones. Second, their recording app encodes all audio as AAC Plus files, instead of linear audio files. However their audio expert claims that sound APIs are available which could make linear audio recordings possible in the future. I was able to obtain photos of two internal Nokia charts which you won’t find anywhere else. The first shows how typical smartphones start to distort around the sound levels experienced at concerts. 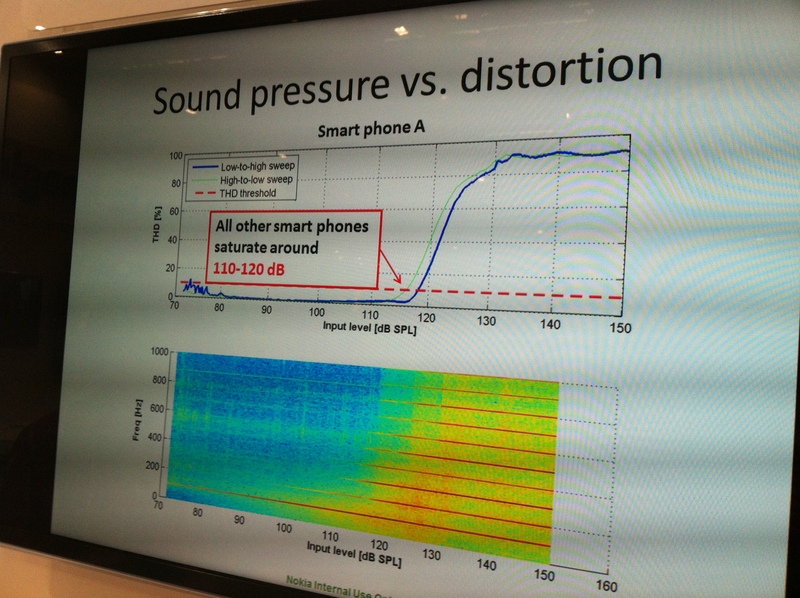 The second chart shows how the iPhone 4S has almost 20dB of attenuation at low frequencies. Sorry for the low-quality, but these were taken quickly from an iPhone 4 under less than ideal conditions. Will Anyone Buy This Product? It’s rare that a company comes out with a product that leapfrogs its competitors as much as the PureView 808 has. However, this shouldn’t be a total surprise to those who have been following Nokia for some time. Nokia came out with it’s first camera phone back in 2002. Followed by an 8MP camera phone in 2009, and the world’s first 12MP camera phone in 2010. The PureView 808 may be years ahead of what Apple is doing in terms of audio, video and photo quality, but it’s unclear to me who will pay $200-$500 for a Symbian-based phone in 2012. This will get interesting however when Nokia releases this technology on the Windows platform. But, because this is so closely tied with Symbian, that could take longer than expected. Nokia was also showing a free new streaming music app for Windows Phones called Nokia Music. Like Pandora, it creates stations based on artist searches. Unlike Pandora, it can store up to four stations so they are available offline listening. Stations are limited to 50 songs per track however. Unfortunately their new Lumia 800 phones which come with this app use Microsoft’s Zune app to sync music. Windows Phone Connector on Mac. Nokia also showed some new Play 360 speakers which uses Bluetooth to beam music from the phone. 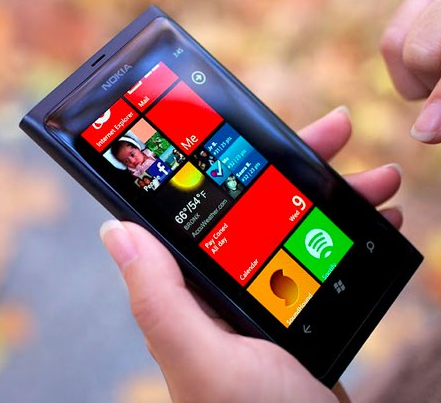 Just tap your Lumia 800/900 phone to connect, no pairing is required because the phones include NFC support.